I wanted to do a blog post like a week ago, but life happens as it always does and I just couldn’t get to it. So here I am now, sharing last weeks news: I am was at the halfway point on my current tapestry and so very excited about the progress I’m making and how it’s turning out! Check it out…. I’m weaving it sideways, by the way, so you’ll have to turn your head. Seeing as though this was last weeks news, I’m now about an inch away from finishing, not including weaving the hem. I’ve really learned a lot about using hachure, hatching, and color combining to get that lovely, blended look. I can see similarities between this weaving and my paintings, which is something I’ve been trying to bring to my tapestries. 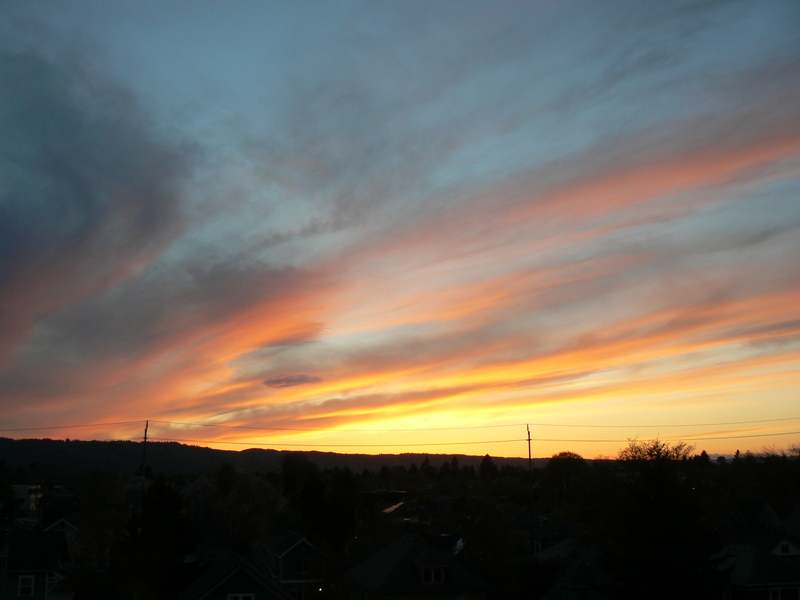 You may not be able to see it in the photo but there is a lot of depth of color and a real liveliness to the scene. I think this piece marks a cornerstone in my subject matter. I’ve always loved animals and storytelling, and have worked with this imagery off and on since childhood. My thesis for my undergrad was on the interconnectedness of nature and spirituality. I think this will always be the overall theme of my work, now I’m just fine tuning it. 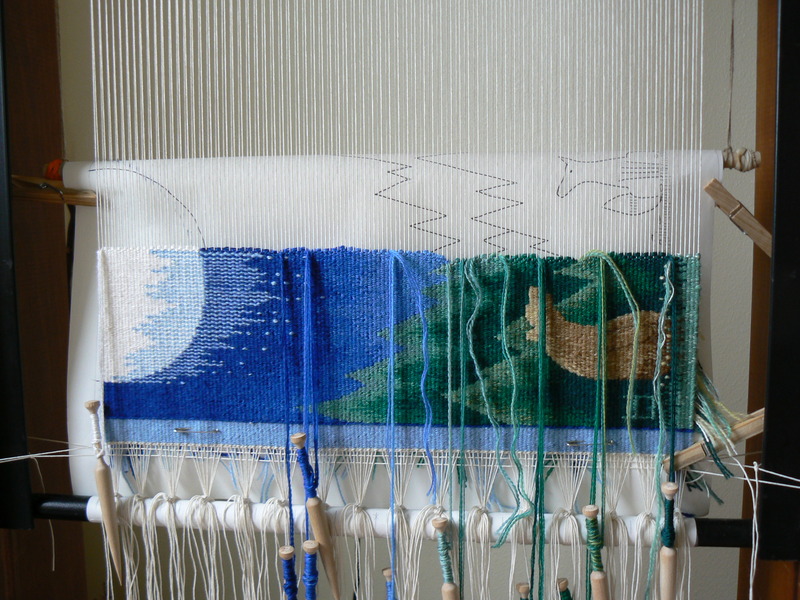 Two reasons why I chose the title for this post: The first and obvious one is that tapestry weaving takes a loooooooong time. 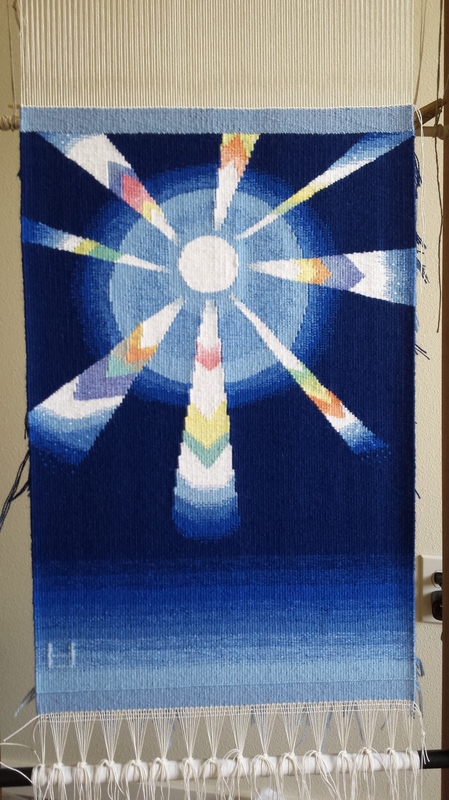 A fellow tapestry artist posted on her blog a while back a photo of a weaving by a different artist. I can’t find the photo or who the artist was, but trust me, it’s great! It’s a simple tapestry that just says “This Takes Time”. Can’t get more obvious than that. I could have painted this weaving in a day or two, but the process of finding colors, winding bobbins, pulling warp threads, and working slowly and methodically has such a captivating quality for me. Even though I still enjoy painting, working with fibers bring my creativity to a whole new level. Weaving is challenging and rhythmic in it’s linear format, and you have to remain focused on the area you’re working in while keeping in mind the whole picture. When I sit down at the loom, I set down my worries for a while and focus on what’s in front of me. Line by line, inch by inch, my creation creeps up the warp threads and takes on a life of it’s own. I’m looking forward to sharing the finished tapestry with all of you next week. Bye for now! This entry was posted in Uncategorized and tagged animals, painting, storytelling, Tapestry weaving, time on April 24, 2014 by lauralunastudio.